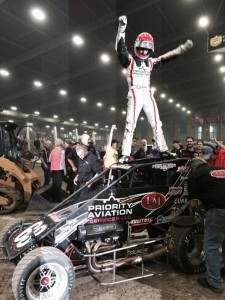 Clauson flag to flag to win night 4 Chili Bowl | Talking Speedway, Speedway news from around the world! The defending Champion Bryan Clauson had his Priority Aviation Joe Dooling / Rusty Kunz Esslinger perfectly programmed with the auto pilot set to win from the opening lap. Clauson started his defense perfect with heat, qualifier win and looks very fast and confident on the track. Clauson and Darland on the front row rolled to the green and Clauson immediately set about stamping his authority over the 24 car field. Clauson led the field from Darland; Pittman and the big early mover was Boat charging up to 4th from his 8th starting position. Boats early race pace soon saw him pass Pittman and assume third behind Darland. Boat and Pittman managed to work pass Dave Darland who was now coming under threat from Damon Gardiner. With the race entering lap 22 trouble arrived for Darland and Gardiner when they get tangled up, putting an end to their transfer chances. Pittman and Boat were racing hard for the spot behind the untroubled Clauson. .The race was pretty uneventful with Clauson dominating and the big question was who would come out on top in the battle between Pittman and Boat. .After an ordinary set of lead up races Tanner Thorson put his little Toyota Beast to work with an impressive win the second B feature to secure his A Feature start .Starting out of P18 in the A Feature Thorson was the biggest mover all night ending up in a very creditable 4th place just ahead of Darren Hagan and Woo Late Model star and 2006 Chili Bowl winner Tim McCredie. 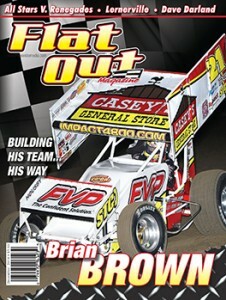 Brian Clauson was asked what it would mean to win back-to-back Drillers, Clauson replied, “It would be huge; this place has been under an evil reign for a long time. I got to sit here next to Kevin [Swindell] last year and talk about how easy it is to win off the front row, and this and that. We are on the front row this year, and hopefully it’s as easy as he says. Hopefully we can make 55 good ones, and be sitting here again tomorrow. 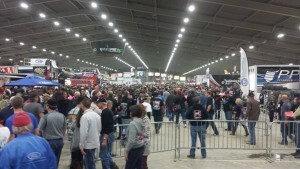 This entry was posted in Chili Bowl, Midget Speedcars, The US Report by admin. Bookmark the permalink.